xii, 255 pp. 15 Color illustr. Paperback. EUR 49. 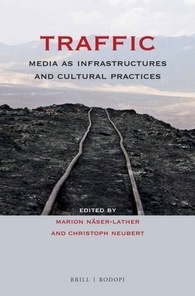 This book presents a collection of texts by distinguished international media and cultural scholars that addresses fundamental relationships between the logistic, symbolic, and infrastructural dimensions of media. The volume discusses the role of traffic and infrastructures within the history of media theory as well as in a broader cultural context: Traffic is shown to constitute an important epistemological and technical principle, a paradigm for exchanges and circulations between discoursive and non-discoursive cultural practices. This opens an encompassing perspective of media ecology, and at the same time illuminates the formative power of traffic as structuring time and space: Material and informational traffic creates, maintains, and undermines power, configures meaning, and facilitates appropriation and resistance. The collection presents results of the international conference "Media Transatlantic IV: Traffic" held in March 2012 at the University of Paderborn, organized by the Research Taining Group "Automatisms". With contributions from Menahem Blondheim and Elihu Katz, Grant David Bollmer, Richard Cavell, Wolf-Dieter Ernst, Norm Friesen, Peter Krapp, Martina Leeker and Michael Steppat, Jana Mangold, John Durham Peters, Gabriele Schabacher, Wolfgang Sützl, and Hartmut Winkler.